In the thick of the cultural upheaval of the 1960s, Jim Steranko’s work hit comics like a smart bomb. In Nick Fury, Agent of SHEILD, there was something new on every page. As a little kid I thought my head would explode looking at the special effects that he layered into his furiously experimental designs. Stories of his uncompromising nature made him even more impressive in my eyes. Steranko’s autonomic rejection of assembly-line comics production and his standing his ground for his artistic integrity made me and others like me all think of self-publishing as an option. Although he had to fight to experiment, his work in the 4-color process set technical and content standards that the companies have profited from ever since. 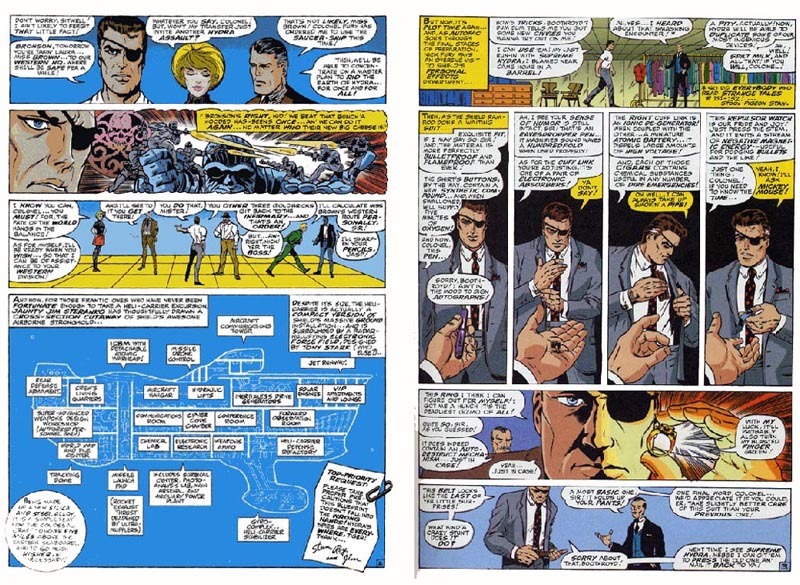 The series of unprecedented narrative devices and techniques created by Steranko has never been compiled, investigated, and analyzed in terms of their importance to the evolution of the comic book medium by either fans or experts. Some artists have incorporated his iconic figurative concepts in their work, and some have even scratched the surface of his timing innovations in panel breakdowns and editing patterns, yet few have mined the subtler areas of his innovations. Many of these were decades ahead of their time, and have not yet been adapted, or even understood. I didn't understand the full scope of Steranko's ideas until I conducted the interviews that led to the INNOVATIONS list. In these we systematically examined his work, beginning with the earliest material and analyzing the content, motion, temporal direction, pacing, and tempo of each panel and annotating the conceptual content. COMIC ART FORUM: I was staring at pages 2 and 3 of your first solo SHEILD story, Strange Tales 154, published on 3/67, catching a few bits, but Marguerite saw the real goods. 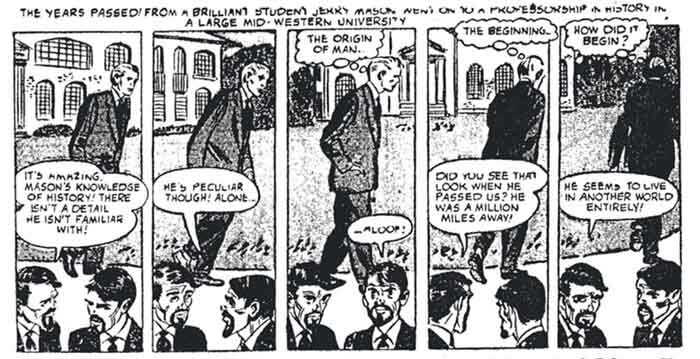 The first page established the location, so in page two panel one we get a character shot. Panel two takes us inside Fury's head to an iconic battle of agents held by a giant Hydra, tiny figures setting us up for the detail you have put into these pages. You are in essence telling us, this is how MY mind works, look deeper. Marguerite wondered if showing Fury's thoughts in such a manner in panel two qualifies as innovation, but I’m sure the drawing of the battle itself harks back to many comics with such differing-scale figures. Panel three has the tiny cast standing on a receeding grid. Marguerite commented, "He's showing us how he thinks..... I'm sure he's a very good chess player." I pointed out that the culmination of your storyline is the chess game beween the Prime Mover and Dr. Doom, and she said, "The 3 dimensional/4 dimensional dynamic of movement and strategy continues through the storyline---is the storyline, is used as a device to take you inside the character's heads and through their thought processes ...time/space---then the linear quality is a further layer...the elaborate knot" (oh right, I showed her your recent Kavalier/Miracle poster, she had wondered about the accuracy of the knots). One wouldn't be able to locate these scenes at all if it hadn't been for the techno/establishing shot on page 1. The grid sets up for the mechanical drawing in the next panel. You have some of the dynamics of the characters delineated, even to the sarcastic comment that the black character is going to sharpen pencils! The space then flips up to the page surface for the schematic, a drawing of a drawing, or as Marguerite said you take us from the microcosm to the macrocosm in one page. On page three, we get the scenes of Fury getting his high-tech personal items from Boothroyd, he has them STANDING ON the panel border line of the top tier, tier two is a cinematic/animated series of panels from Boothroyd's perspective, the reader is Boothroyd...panel six shows Fury showing us the ring, it further involves us in the space, and is a fine bit of detail that emphasizes the gem-like quality of detail of these pages, encouraging us to continue to look closely...and in panel 7 we get a funny joke about Fury's belt being the only bit that doesn't have hi-tech capabilities, it just holds up his pants; however some 4 or 5 issues later it is his last ditch weapon to get him out of a tight spot, so this is actually foreshadowing. All of this going on in two pages. JIM STERANKO: I'm really blown away by the analysis you and M have developed on my first solo SHIELD. I'd bet not one in a thousand would make the correlation between the "chess-board" long shot and the chess-playing climax of the story nine months later! This is the kind of foreshadowing I learned from film, not comics. What really sets me apart from the pack (besides the multitude of failures I inflicted upon readers) is that old-timers learned their narrative processes from comic strips (Caniff, Foster, Raymond, Sickles, Crane, etc) and neophytes learned it from them! There are very few exceptions. When the men who created the rules and rhetoric of the comics form got together to decide on the architectural details, they failed to invite me. Consequently I found no reason to subscribe to their tenets. When I joined their ranks in 1967, the narrative devices that had been adopted and sanctioned for about half a century were considered untouchable commandments that were permanently etched in stone. Pages, panels, captions, and balloons were the essence of the comics format, all artifices considered unalterable by my peers. While I revered the work of Kirby, Lee, Wood, Crandall, Williamson, Kurtzman, Toth, Kubert, Meskin, Powell, Severin, Fine, Cole, Wolverton, Schomberg, and many others and respected the conventionalizations by which they told their stories, I was appalled by the self-imposed constriction under which they worked. How, I wondered, could the most liberal and imaginative forum be so terminally rigid, predictable, and formulized? Why did even those creators with expansive visions accept the shopworn, cliched rudiments handed down over the decades without any sign of reform or rebellion? I was baffled! Since I had made no agreement to comply to the prehistoric code, since I wasn't part of the succession of the regimented, since I embraced the work not to conform, but to explore my own vision and, in the process, the comics form internally and externally, I opted to make my own rules, the first of which is there are no rules. The art of storytelling has a much broader potential range of nuance and sophistication than has yet been explored, in addition to almost unlimited experimentation possibilities. The art itself does not, except in rare cases where commercialism is not a factor. Consequently, my real contribution to the form is lying fallow, not exploited and showcased to the point where it inspires others to take notice and think in similar directions. In a certain way, modern comics have regressed! Here's a clue to another aspect of my work that's never been discussed: it's riddled with magical principles: Multiple disguises, optical illusions, bizarre restraints, impossible escapes, misdirection, lockpicking, camouflage, invisibility, hypnotism, duplicitous action and imagery. These elements are threaded through all my work. Remember: nothing is ever what it seems to be. CAF: O.K. let’s try again: Strange Tales 154. Micro-to-macrocosm transition: Page 1: floor-level establishing techno shot to page 2 panels 2-4: inside Fury's head to "chess" panel to schematic of HeliCarrier, 1st overtly deconstructive approach to comics, with cinematic foreshadowing. CAF: Well, who qualifies? Some in D/S strips probably. Will Eisner? Bernard Krigstein? 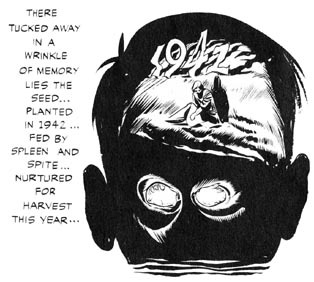 Harvey Kurtzman in Mad, maybe. Page 3, 2nd teir: POV shots with animated hands and Fury. 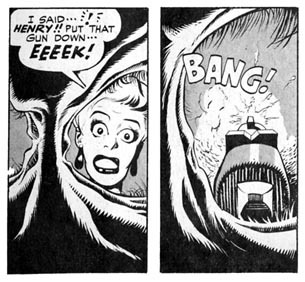 STERANKO: Mort Meskin did POV shots in the '50s. Yes? CAF: Don't really know that stuff of Meskin's, unfortunately, but I do know Dylan Williams, the "Meskin man." Left: Mort Meskin's POV hands. Right: Bernard Krigstein's POV hands. I don't believe the Meskin and Krigstein POV hands shots that Dylan scanned for us are similar to your sequence of the POV animated hands sequence, which is bound up in the larger spread of panels, and goes to a deconstructive awareness and involvement by the reader....so: deconstructive POV sequence with multi-level animation. Page 6 panel 1 Robot Repair Rats: first cute but functional robot plot devices? STERANKO: Functional robot devices in EC's Bradbury/Wood tale Soft Rains. CAF: I was thinking of Star Wars and every other movie that has the cute robots. Page 8, panel 3 1st positive/negative paste-up strobe effect, even applied to lettering. CAF: Page 9 panels 1-4 cinematic/animated transition with soldier performing port arms military rifle order, and the willowy female figure advancing in space. I'm not completely sure whether Bernard Krigstein used transitions in this manner, his were usually for time rather than space, rarely if ever both, I think? STERANKO: Check for specifics, but I agree. CAF: I looked at Master Race and others in that nice hardcover by Greg Sadowski, he did mostly time trasitions, some 1 or two-figure space movement but mostly Krigstein animates on one shallow plane. 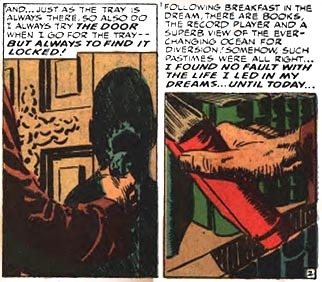 I was sent a Krigstein package by Kirby-L that included a Krigstein sequence from Strange Tales #45, 1956, with two layers animating across a continuous background, the man going across the panels, and the two men in the foreground. This is still a shallow space, nonwithstanding the background, the foreground figures are apparently sliding sideways, and it doesn't compare with your complex sequence with the military gun handling of the soldier in the foreground and the depth of field embodied by the advancing agent w/zipatone. 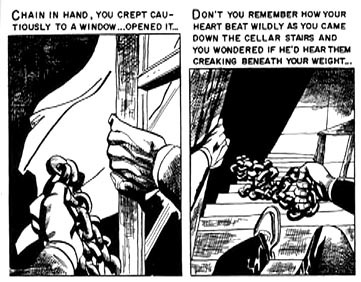 Others had probably done what I would call animated sequences before Krigstein even... Will Eisner; Alex Toth, Jack Kirby, and Harvey Kurtzman did some in the fifties. But, Krigstein's were the most developed...until Steranko. My take in the end, is that this qualifies as: multi-directional multi-figure animation sequence. STERANKO: Animation is the wrong word, rather use motion sequence, and for a set of panels with several elements moving independently we could call it a contramotion sequence. "...As far as the opinions which I had been recieving since my birth were concerned, I could not do better than to reject them completely for once in my lifetime, and to resume them afterwards, or perhaps accept better ones in their place, when I had determined how they fitted into a rational scheme. And I firmly believed that by this means I would succeed in conducting my life much better than if I built only upon the old foundations and gave credence to the principles which I had acquired in my childhood without ever having examined them to see whether they were true or not..."